As a by-election eventually won by Irish immigrant and newspaper editor Daniel Tracey drew to a close in May 1832, magistrates supporting his opponent, loyalist Stanley Bagg, called in the British troops from the local garrison. Ordered to open fire on a supposed mob, the troops killed three innocent bystanders following what has been qualified ever since as a riot. 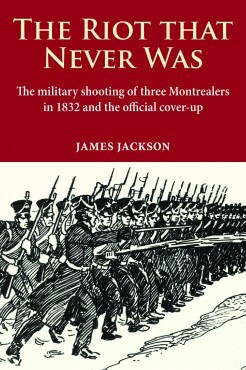 James Jackson establishes that the riot simply never happened and that there was no mob when soldiers opened fire. His proof is corroborated by affidavits presented to a packed grand jury that exonerated the soldiers and officers and the magistrates who called in the troops. The grand jury comprised a majority of recently arrived English-speaking Protestant farmers even though the three victims were French Canadian and Catholic. Most troubling is the fact that historians have not questioned the official story. In this historical “whodunit,” James Jackson is a one-man investigative commission, combining the moral indignation of an Émile Zola and the writing talent and historical perspective of a Pierre Berton. Although the names of François Languedoc, Pierre Billet and Casimir Chauvin have been forgotten, their story deserves to be known. This fascinating, methodical investigation into a little-known tragedy proves that truth can prevail 180 years after the events. James Jackson holds a DPhil from Oxford University. He taught French and Quebec Literature and History for 25 years at Trinity College Dublin. Twice elected president of the Association for Canadian Studies in Ireland, James Jackson now lives in Montreal.